The gently falling snow creates a stillness not often found in the suburbs of Kansas City. It's cold. Unfathomably cold. Wind chill dips the temperatures into negative double digits and school is closed to protect children from the harsh, cutting winds. The ground is hard. It's difficult to imagine that life still exists beneath the ice and that, soon, it will begin sprouting forth. 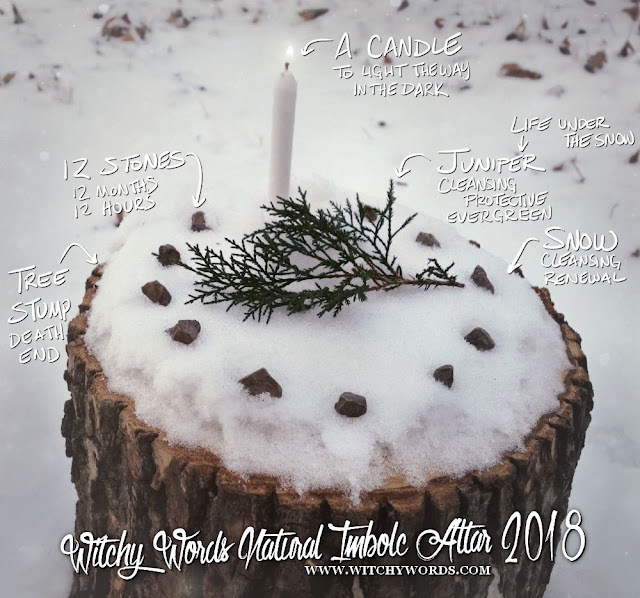 Imbolc may be considered the start of spring for some but it's often the deepest part of the winter here in the Heartland. We get the majority of our snow and the worst of the cold in January and February. It shows little signs of stopping by the sabbat. February Eve, or Imbolc, is the midpoint between the longest night and the coming equinox. This is a holiday of new beginnings and fresh starts. The snow and deep freeze represents a cleansing and renewal of the earth, yet life still stirs beneath this frigid land. There it is: The spark of light in the dark. 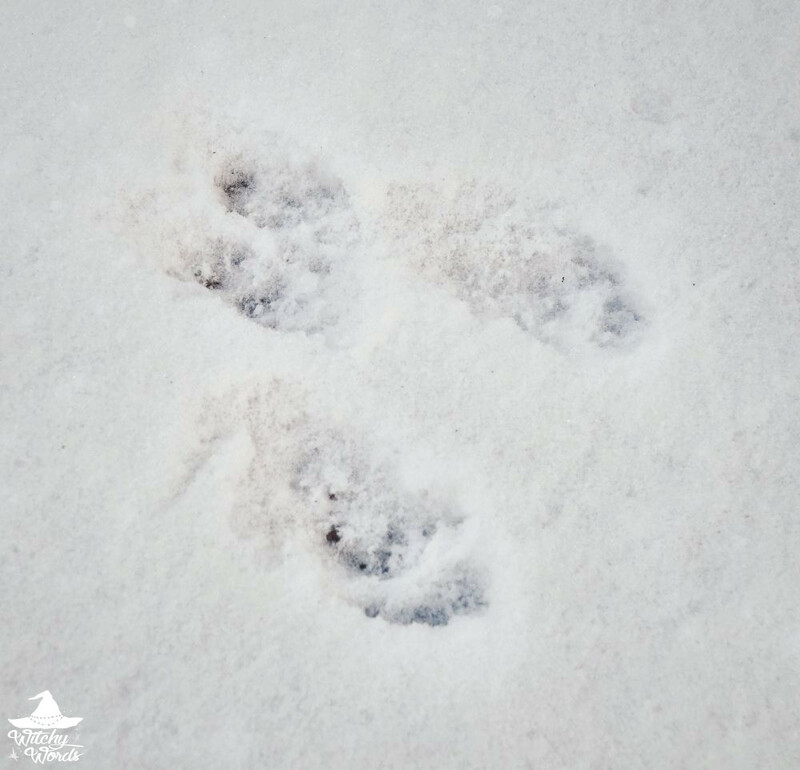 The days grow longer and, eventually, the snow and cold will lessen. Last year, I initiated my new entry altar in the sabbats. This year, I turn it over to our esbats - the full moon rituals my circle participates in - and look in a different direction for the holidays. One request I received was simplicity: Sabbat altars that don't require any money or heavy amounts of effort. While previous altars were constructed completely of thrift store finds or items I already had, I see the need for this and plan to fulfill it this year with a natural sabbat altars series. I cannot go out and purchase anything for these altars. The altars must be made of natural items found around my house, in local parks and walking trails or items that I already own. The value of already-owned items cannot exceed $5 and should be easily accessible items. The emphasis should be on natural items. The altar can take no more than 10 minutes to put together and photograph. For this altar, I utilized a candle as my non-natural, previously owned component, likely valued at a dollar or less. The rest of the altar was completely natural and the items I used were found in my own yard. I collected pebbles from my backyard and took matches and some coffee grounds with me. Once out my front door, I cut a small section of my juniper bush for this altar. The used coffee grounds were brought as an offering which I added to the base of the shrub in return. The middle of a deep freeze isn't the best time to trim an evergreen by any means, so I was certain to cut from an already dying branch and only a small piece at that. As I turned the corner, I saw signs of life: Rabbit tracks around the stump I planned to use as the altar. The stump itself is nothing special: Just pieces of the maple that fell during the March 2017 storm. 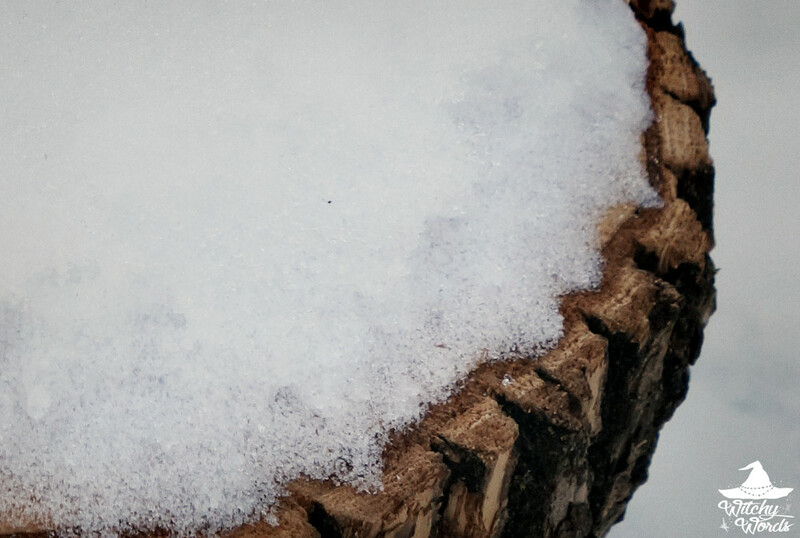 In this case, this stump represents the dead and fallen in the cold. A layer of cleansing, renewing snow topped it and gave me a clean canvas for my work. 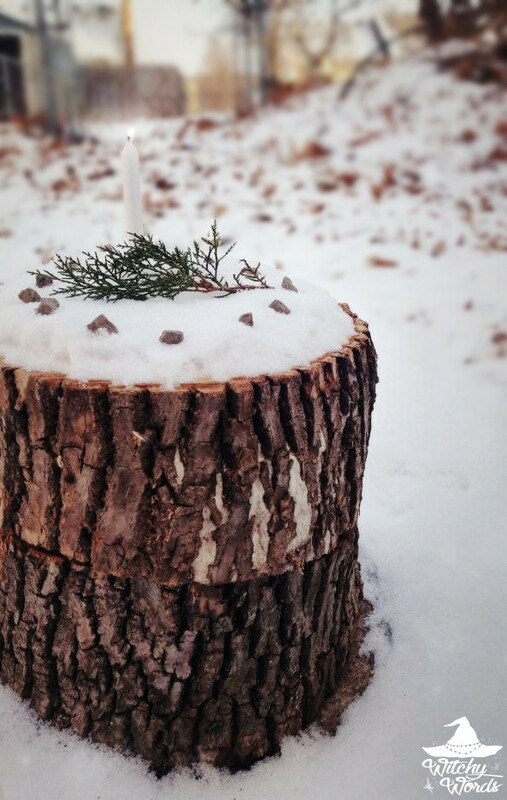 I began by placing the twig of juniper in the center of the stump. 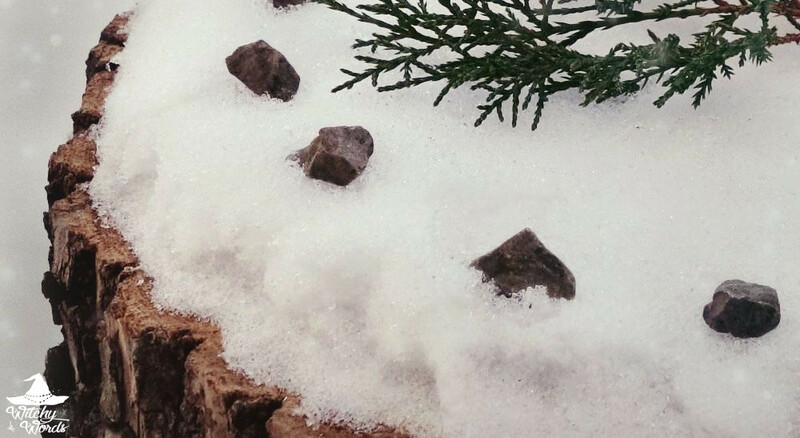 Juniper is used in smoke cleansing bundles and is often both cleansing and protective in nature, much like the snow and ice on the ground. Around the juniper twice, I placed twelve small stones. There are twelve months in a year and twelve hours to each part of the day. Twelve seems like an apt number for the first major holiday of the year, representing a continuity of protection and cleansing as we move forward. 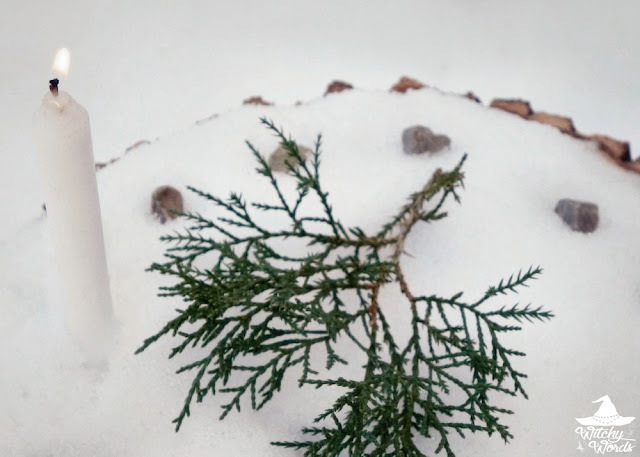 Finally, at the top part of the altar, I dug the candle into the snow to keep it upright and lit it. The breeze made it difficult to light but, eventually, the flame took off against the cutting wind. And so my simple natural altar was complete. Representing a continuity of cleansing and protection for the coming lighter and warmer months, I took a moment to meditate on the meaning behind the sabbat. But, of course, not too long. It was, after all, negative double digits outside. I'll leave you with a visual description of this year's February Eve altar. Enjoy! I hope everyone has a blessed February Eve! That is my kind of altar, simple and natural, LOVE IT! Thank you so much, Di! Love it! The only stump in my yard at the moment is covered in an ant hill. Yes, the fire ants have a hill that goes around the base of the stump and another part on top of it. They are also in a planter I had on top of the stump. Perks of living in Georgia...you can't go anywhere in grass without encountering fire ants. I was hoping the several days of snow we had for a change would kill them off. Yeah no, they just built bigger nests. This is kind of a... self-created stump. It's technically two pieces of left over wood from the tree that fell last year placed on part of the cement around the side of our house that we can't park on because there's not quite enough room. I'll probably be moving it around depending on what I'm doing. Mobile stump!